WISMEC Gnome Tank is featured with 2ml E-juice capacity, a convenient retractable top filling design as well as an adjustable bottom airflow for huge vapor. Together with the unique 0.15ohm and 0.2ohm WM coil heads, the WISMEC Gnome will bring you a great vaping experience with nice flavor and large clouds. It is best compatible with the Reuleaux RX GEN3 MOD. • Best compatible with Reuleaux RX GEN3 MOD. 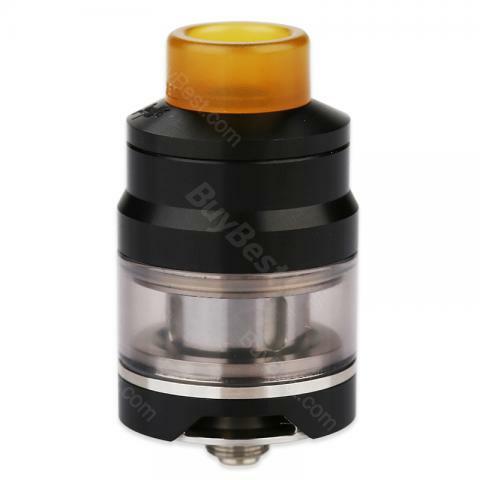 • The replacement WM coil heads and WM RBA head/ WM RBA Kit are also available in Buybest. Buen Claromizador. Las resistencias son muy apropiadas y el tanque bastante comodo. Good all be it standard vape tank offering 2mm or 4mm capacity when plastic plug is removed. Decent vape with acceptable draw. Coils last somewhat longer than average. As other reviewers say, this little guy creates lots of flavor. It comes with a dual and a triple coil. I am vaping max VG with 6mg Nic but it might be better with 3mg Nic. If you are looking to get into sub-oming, this is your tank, and for the price, you can't beat it. WISMEC Gnome Subohm Tank is a 2ml capacity tank. A subohmclearomizer with a content of 2ml. This tank has a top-fill filling capability, adjustable airflow and subohm coils suitable for high wattages.